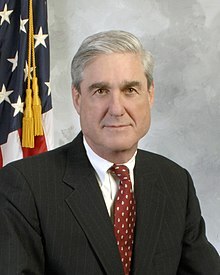 Bronze Star Medal w/ Combat "V"
Navy and Marine Corps Commendation Medal (2) w/ Combat "V"
Robert Swan Mueller III (/ˈmʌlər/; born August 7, 1944) is an American lawyer and civil servant. He was the sixth Director of the Federal Bureau of Investigation from 2001 to 2013. He is a Republican. He was appointed by President George W. Bush and his original ten-year term was given a two-year extension by President Barack Obama. Mueller is the longest-serving FBI director since J. Edgar Hoover. He is currently head of the Special Counsel investigation of Russian interference in the 2016 United States elections. ↑ "FBI Nominee Lauded for Tenacity". The Washington Post. July 30, 2001. Retrieved May 17, 2017. ↑ "Robert S. Mueller, III, September 4, 2001- September 4, 2013", Federal Bureau of Investigation: "he served as an officer for three years". ↑ Rosenstein, Rod. "Rod Rosenstein's Letter Appointing Mueller Special Counsel". The New York Times. Retrieved May 18, 2017. This page was last changed on 26 June 2018, at 04:45.